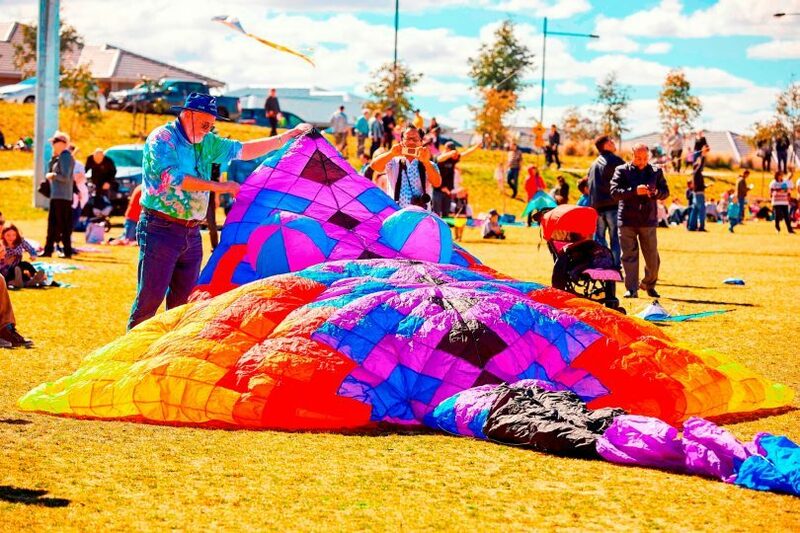 This Father’s Day, enjoy a family fun day out at the Googong Flying High kite festival. Photo: Supplied. With the first day of spring and National Wattle Day this Saturday and Father’s Day this Sunday, there is plenty to celebrate this weekend. Celebrate Father’s Day by riding on a steam train with your dad or blending a new wine with him at Mt Majura Vineyard or flying a kite with him in the skies above Googong. Celebrate National Wattle Day by taking a walk in the Arboretum or learning how to photograph the flower at the Botanic Gardens. There are also some great theatre shows on this weekend with the Sydney Theatre Company in town and the Street Theatre’s latest production, Venus in Fur to check out. This Saturday and Sunday, the NSW and Canberra Rail Museums are running steam train rides from Canberra Station to Queanbeyan and Bungendore on Australia’s most powerful operating steam engine—the Beyer-Garratt 6029. The trip to Queanbeyan and back takes 45 minutes and the trip to Bungendore and back takes 2 hours and 15 minutes. The train travels to Queanbeyan on Saturday at 9 am, 10 am, 11 am and 12 pm. And the train travels to Bungendore on Saturday at 1:30 pm and Sunday at 9 am, 11:45 am and 2:30 pm. Tickets are $30 for adults, $25 for concession and members and $20 for kids aged 2–16. Book here. The Fireside Festival continues this weekend. Highlights include a Spring Dog Party at Murrumbateman Winery on Saturday 10 am–5 pm and a Meet the Makers of Bungendore at The George Bar on Saturday 12–4 pm. Check out the full program here. The Sydney Dance Company is in town this weekend with its latest production ab [intra] which is Latin for ‘from within’. Choreographed by Artistic Director, Rafael Bonachela, this production explores our primal instincts, impulses and visceral responses—it is a journey from tenderness to turmoil. Tickets from $49 for adults, $39 for concession and $30 for under 27s, book here. Venus in Fur is a play by American playwright David Ives. It tells the story of playwright and director Thomas Novachek who is wanting to cash in on the success of Fifty Shades of Grey and so adapts a 19th-century tale Venus in Furs for the stage. Thomas’s play charts an obsessive relationship between a man and his mistress to whom he becomes enslaved. At the end of a long day of auditions for the role of the mistress, actress Vanda Jordan shows up unannounced wanting to try out for the role. Thomas reluctantly agrees to the audition but soon finds himself in a situation where desire twists and turns on itself and the line between acting and reality blurs. Directed by Caroline Stacey and starring Joanna Richards as Vanda and Craig Alexander as Thomas, Venus in Fur explores sexual politics, gender and power. Tickets are $45 for adults, $42 for concession and $35 for students. Book here. Join Dr Suzette Searle from the Wattle Day Association for a walk at the Arboretum to enjoy and learn about wattles in flower. This is a free event, meet at the Arboretum’s Information Desk. The Botanic Gardens is celebrating Wattle Day with a three-hour photography workshop by Irene Lorbergs from the Canberra School of Photography. Irene will demonstrate how to photograph different wattles and talk about lighting, colour, composition, depth of field, angles and perspectives. This workshop is suitable for beginner and intermediate photographers aged 15 and over. Tickets are $150, book here. Play winemaker for a day at Mt Majura this Saturday. The vineyard’s winemaker Frank van de Loo will demonstrate the art of blending Mt Majura’s multi-award-winning TSG (Tempranillo, Shiraz, Graciano) wine and will then provide the ingredients for you to blend your own TSG wine. Start by tasting the current 2016 TSG blend and then each component of the yet to be blended 2018 TSG. Then it’s over to you to make your own TSG blend. Each blend will be tasted by a panel of judges including a local sommelier with a prize for the best wine. While the judges contemplate, enjoy regional tasting platters. Tickets are $40, book here. See hundreds of kites flying in the sky over Googong this Sunday at Googong’s annual kite flying festival. Now in its fifth year, the festival is a great community event. In the sky, the visual feast will include a giant jellyfish, a humpback whale, flying bunnies and piglets, while on the ground local chef Harish Chocha will be feeding the crowd with Boss Burgers.